When it comes to taking care of your yard, there are various tasks to consider. Mowing the grass, trimming the hedges, weeding, and so much more. One of the most important things you can do is to take care of your trees. Just like your car, your home, and even your body, trees need regular maintenance to grow and live at their full potential. You can ensure your trees are properly taken care of by contacting a tree service professional. Not only can they help you with maintenance, but they can help with other things, too. As you consider tree care, you can count on a local Tree Service Professional to assist with your needs. One thing a Tree Service Professional can help you with is regular maintenance. Each tree is different as to what it needs and how often it needs it, but maintaining your trees is important. A professional can trim your trees and do all the things that need to be done to keep them healthy, year after year. Along with that, they will be able to examine your trees to determine if there is any additional care that they may need. Professionals who service trees can do more than maintain trees, they can also help you with other tree care needs. They can help you if you need to have a tree trimmed or removed. Another thing they can do is help clean up tree debris that may have been caused by some kind of storm. Removing stumps is another service that many tree care companies provide. 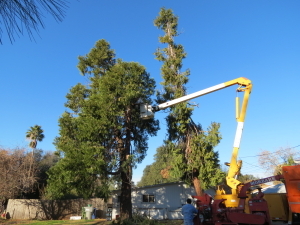 Nearly anything related to dealing with trees can be done by a company that specializes in tree If you are in need of a tree service professional, you want to find a reputable company. You can do this by asking around to learn if anyone you know has a good recommendation. Another option is to search online. The more you learn about your options and what people have to say about their experience with them, the more informed your decision will be when it comes to making a choice as to who to hire. Once you have found a company that you would like to use, give them a call and make an appointment to discuss your needs. The professional will likely need to visit your residence to look at the trees in question and help make a decision as to what exactly needs to be done and how much it will cost you. This is a good time to learn about the company, the services they offer, and determine if they will work out for your needs. As you can see, a tree service professional is able to help you in many different ways. Should you need to hire one for your tree care needs, make sure to get recommendations and learn what you can about the company. Hiring a reputable and trustworthy tree care company is a smart decision for the health of your trees.